We the Indigenous People of Biafra worldwide under the command and leadership of Mazi Nnamdi Kanu, wish to state categorically and for the avoidance of doubt that we still hold Gov. Okezie Ikpeazu, Nnia Nwodo led Ohaneze Ndigbo and 4 other Igbo governors responsible over the siege and invasion of our leader's compound in Afaraukwu Ibeku Umuahia from the 10th to 14th September 2017. The repeated denials of Okezie Ikpeazu and his hired hands will not eradicate the fact that, he, along with those mentioned above designed and perfected Operational Python Dance and the accompanying killing spree ostensibly to eliminate our leader Mazi Nnamdi Kanu since he cannot be bought or compromised. Okezie Ikpeazu therefore should stop lying through his teeth about his real motives for imposing the curfew that followed the attack on Kanu's home. Governor Okezie Ikpeazu and his co- conspirators in the person of Willie Obiano, Dave Umahi, Rochas Okorocha, Ifeanyi Ugwuanyi and Chief Nnia Nwodo must give true account, before the people of Biafra, how they managed to allow envy and jealousy over the popularity of Mazi Nnamdi Kanu to overwhelm them to the point of conniving with the same Nigerian Army that specialises in killing defenceless unarmed Biafrans, to come and kill yet more Biafran agitators fighting for the liberation of everybody trapped in the unworkable country Nigeria. Okezie Ikepeazu's claim that he imposed a curfew during the invasion of our leader's house in Umuahia to save 11 million Igbos in the North is laughable. Okezie Ikpeazu fabricated this lie in the hope of deflecting rising anger against himself, Igbo governors and Ohaneze Ndigbo leadership for the role they played in the genocidal invasion of Operation Python Dance. The only reason why Okezie Ikepeazu deliberately imposed a curfew in Abia State was to stop IPOB members from mobilising to defend our leader Mazi Nnamdi Kanu during the invasion of his home by Hausa Fulani soldiers that Ikpeazu himself invited into Abia State. If Okezie Ikepeazu, other South East governors and Nnia Nwodo had the interest of securing the lives of Igbos in Hausa territories as they claim, they would not have escalated tension in the country by actively asking the Nigerian Army to come and kill the arrow-head of the largest mass movement on earth which IPOB is. Gov. Okezie Ikepeazu's sole reason for imposing the said curfew was to leave the compound of Nnamdi Kanu defenceless therefore pacing the way for the invading Hausa Fulani Islamic soldiers to kill him and his entire family. We must never forget that 28 unarmed defenceless Biafrans were killed by Nigerian Military in that operation to kill Nnamdi Kanu. Igbo governors and Ohaneze Ndigbo also felt that the perfect way to demoralise the people of Biafra and stop our agitation is by killing everything in site in and around Isiama Afaraukwu village to strike fear into the heart of IPOB, the same way followers of Sheikh El-Zakzaky were slaughtered in their thousands in Zaria with no consequence till date. What Okezie Ikepeazu, Ohaneze Ndigbo leadership and other South East governors didn't factor into their treacherous calculation is that IPOB is a global movement with a unique structure that no man can destroy. Okezie Ikpeazu and his cohorts are dreamers for thinking their well crafted lies which they have been selling to media houses can save them from the impending doom. Biafra restoration effort is a divine project, the sooner they realise this, the better. Governor Okezie Ikpeazu of Abia State and other four governors of the South East alongside Ohaneze Ndigbo had the sole intention of destroying the hope of unborn generations which Nnamdi Kanu has come to represent. By their actions, they have left IPOB no option than to seek justice through non conventional means. At the appropriate time, they will have themselves and nobody else to blame. By bringing Operation Python Dance to the doorstep of Nnamdi Kanu's home, Okezie Ikpeazu has confirmed that genie working for the continued enslavement of the people of Abia State. We have pictures of him handling stolen goods from the palace and house of HRM Eze Israel Okwu Kanu and our leader Mazi Nnamdi Kanu. 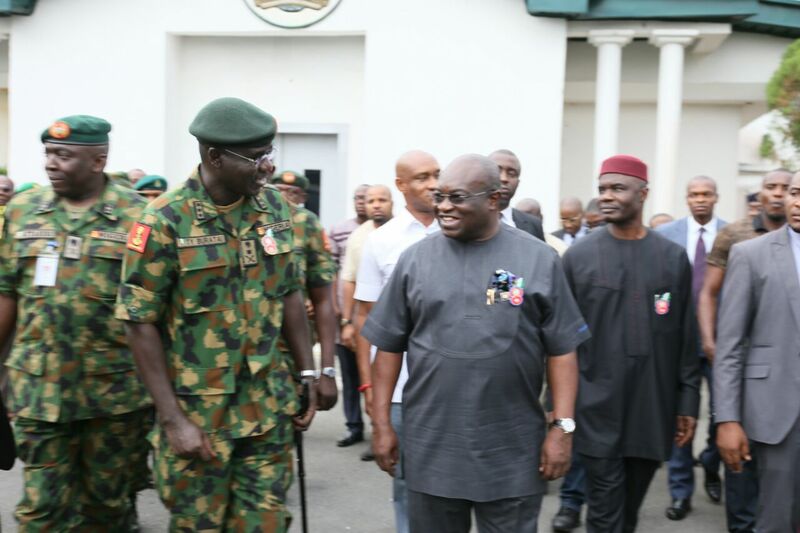 These pictures will prove to the world that Okezie Ikpeazu is a traitor and congenital liar.